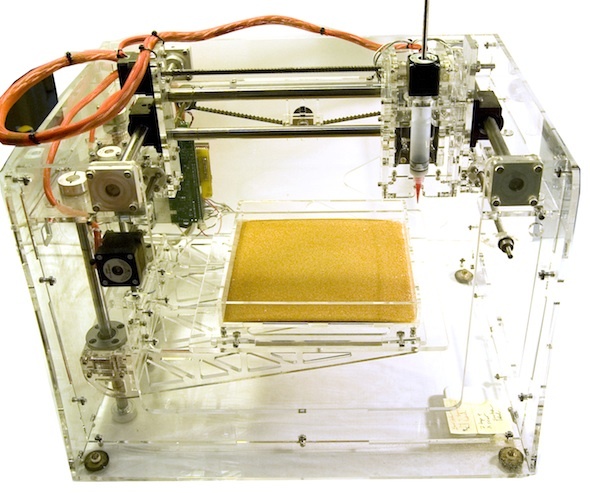 Ginger Krieg Dosier, a professor at the American University of Sharjah (my alma mater), invented an alternative to the traditional way of making bricks by using low-cost rapid-prototyping machines, sand, bacteria and pee. The process starts with sand, which is then printed with a layer of bacteria, calcium chloride, and urea. Microbes in the sand react with that mixture, forming a glue that binds the sand together. The bricks are built up in the printer, layer by layer. Once the process is complete, the bricks can be as strong as marble. Dosier dreams of replacing traditional bricks with her biomanufactured masonry which would reduce world-wide carbon emissions by “at least” 800 million tons a year. She recently won the Metropolis magazine 2010 Next Generation Design Competition, which aimed to find a “small and elegant” but also crucial fix that could have big-time impact if scaled-up. This reminded me of an ambitious recent project by Magnus Larsson at the Architectural Association. 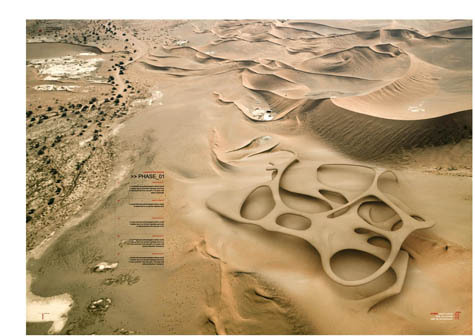 He proposed to use a similar process to solidify parts of the Sahara desert into livable architecture. This may seem like science fiction, but it really does work (on a small scale). It makes me wonder what a large, state funded research project aimed at studying this process and applying it at a larger scale would lead to. Are you listening, KISR? Although this is very interesting, but our problem isn’t carbon emissions!! It is our dependency on depleting fossil fuel without alternative energy solutions in sight yet. Her process is very high-tech and would still require high demands in energy I presume. 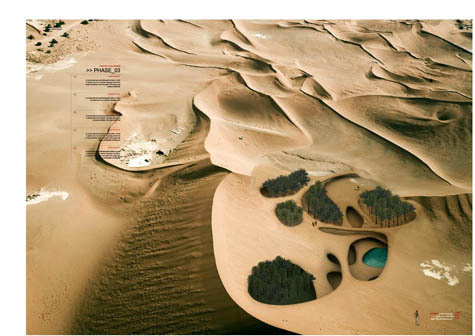 I am a bigger fan of the resurgence in using earth again for building, there are some interesting examples of sand bag earth and rammed earth. Have you seen these? Faisal, you’re right, the problem isn’t carbon emissions in Kuwait, at least it’s not the most immediate problem. But you’re wrong about this being energy intensive. That is the whole point of it, that it’s far less energy intensive than the traditional method of brick-making. Much MUCH less. It’s also not that high tech, the magic happens with the bio-chemistry; the machinery you see, the digital fabrication, is just her way of layering the ingredients evenly and automatically in the form of a brick. Rammed earth is great, but the thickness of the wall is HUGE. It’s not very feasible for us. The compromise is between wall thickness, cost and thermal insulation. http://www.greenhomebuilding.com/images/plans/santafe3F.JPG <–look at that wall thickness! I read about this previously, but the only drawback of the process is that the bricks become toxic to the environment, but I like where this is going and it can be further developed! Hello Barak, Dear Son, Off Course KISR is listening and wants to hear more from u in person, am inviting u 2 visit me in KISR on Monday @ 14:00 in Building and Energy Technologies Department. I shall leave ur name @ the security gate and they shall guide u through 2 my office. Looking 4ward 2 c u.